We stock Baltic Birch plywood, Red Oak plywood, Pre-finished Maple plywood and phenolic coated plywood. Our Red Oak and Prefinished Maple plywoods are made in the USA. This means you will have a plywood that has a veneer core that will not warp or delaminate. These things will make your project easier to manage and ensure that you get a good quality item that lasts. 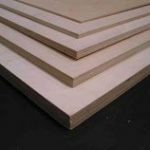 We also ship baltic birch, red oak, prefinished maple and phenolic plywood via UPS in quarter sheet increments or smaller. The quarter sheet pricing does apply on sizes quarter sheet and over when shipping Baltic Birch and Red Oak Plywood. Phenolic and Pre-finished Maple ship in quarter sheet increments with a $5 cutting charge for full sheet purchases. Quarter sheet pricing applies to any quantity under a full sheet for phenolic and pre-finished maple.